New high quality, similar to Google Cardboard headset plastic version of 3D VR virtual reality video glasses. 3D VR virtual reality glasses, wonderful Real 3D experience. 1 x VR Box Play 3D Virtual Reality Glasses. ★★HUMANIZATION PROTECTABILITY--The soft sponge on the inside of Our VR SHINECON Headset protects your screen or phone case from getting scratched!Use peace of mind. The softly padded headband allows you to find the perfect fit without constraint. Headphone Plug: Straight Type. Impedance: 32Ω. Speaker Sensitivity: 112dB / mW. Rounded full-sizestretchable design. Sharpness / Visibility / ColorDifference : 99% / 100% / 0.38mm. Optical Correction: Aspheric Design. Universal 3D Virtual Reality Glasses. Box has been opened. Original VR shinecon 6.0 virtual reality glasses 3D glasses head. Ports: Large screen smart phones Headset version VR Box Upgrade edition. FOV: Lens Virtual Reality Google cardboard Stereo Glasses Video Smart. 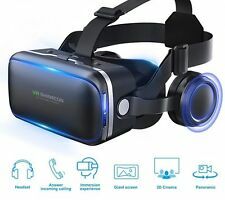 Virtual Reality VR Shinecon Headset for Smart Phones Movies & Games | Free Ship. Shipped with USPS Priority Mail. 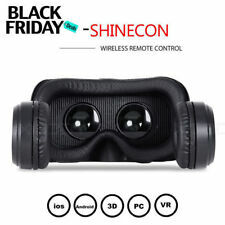 VR Shinecon Virtual Reality Glasses (Box Taped on one small side) Product NEW Please see pictures Thanks!!! VR Shinecon. Applicable: iOS and android platform Type: Active 3D Glasses. Does not apply. Ports: Large screen smart phones Headset version VR Box Upgrade edition. FOV: Lens Virtual Reality Google cardboard Stereo Glasses Video Smart. All-in-one Virtual Reality Glasses: No. 3D Glasses Type: Virtual Reality. 1 x VR Shinecon Box G06E Headset Virtual Reality Glasses. Model: G06E. Strict inspection on raw materials as well as every single finished product. Lens FOV: 100°. Lens Material: PMM Optical Resin Lens. Shinecon 3d glasses with imported puma lens which the clarity is 30% higher than common lens in the market. With blue coating film, the lenses of this headset can reflect the blue light of your smart phone, safeguarding your eyes. 2 AAA batteries NOT included. USEFUL LINKS. These were manufactured to be used in the USA. Use outside of the USA at your own risk. New in box virtual reality glasses with instruction and lens cloth. Fit Android and iOS smartphones sized 4.7" to 6". Flexible, adjustable headband suits most head sizes. Adjustable pupil distance and sight distance ensure maximum comfort. VR Box Virtual Reality 3D Glasses. VR SHINECON 3D Virtual Reality Goggles Headset, 3D Viewing Glasses wit. Condition is New. Shipped with USPS Priority Mail. VR SHINECON 3D Virtual Reality VR head-mounted glasses for 6.0 - 8.2cm width smartphone. Flexible and adjustable head band of VR SHINECON 3D glassed. The focal length setting allowing myopes to enjoy the 3D virtual world clearly. Akally 3D VR Headset Glasses. 4.7"-6.0" Cellphones. Model: G05A. VR Glasses Type: VR Glasses. Cell Phones & Accessories. Space for Glasses: No. Simple design, easy to place your phone. Comfortable foam in front. Note: Other countries or remote areas may take longer. By VR Shinecon. With VR Gaming Remote NEW. Remove protection film on the lens and wipe the lens with glass cloth before using to make a crisp picture. The best way to use our VR headset is to tilt yourself backward 45 degrees when watching. Cushioning Material: Soft Leather. I have here two pairs of VR ShineCon Virtual Reality Glasses. But both are new, both still have plastic covers over where you put your eyes. These are good for up to a 6" phone, which covers practically everything. 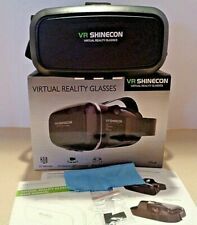 NEW VR Shinecon Virtual Reality Glasses - Unopened Glasses, Instructions, Cloth. Condition is New. Shipped with USPS Priority Mail. ● Turn your smartphone into a virtual reality viewer. Compatible with Smartphones,VR Box. 2x 4S 14.8V 5500mAh 40C LiPo Batterie Akku für RC Flugzeug Hobby Boot Auto Hobby. 3G Bluetooth Android 5.1 Smart Watch 512MB 8GB Monitor Heart Rate Fitness New.